TRIVIA of Noh : Q101 : Did Zeami finally manage to return to Kyoto? 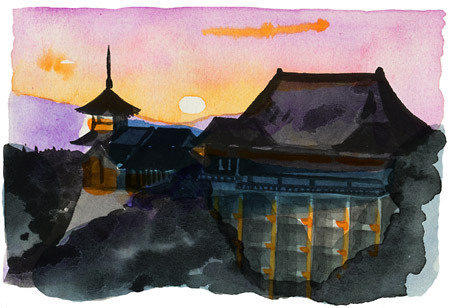 | Home | Trivia | Q101 : Did Zeami finally manage to return to Kyoto? Did Zeami finally manage to return to Kyoto ? It is still unclear whether Zeami managed to return to Kyoto in his final years, after his exile in Sado. Around 1960, a record about a person named Shiō-Zenmon was found at Fuganji Temple in Tawaramoto in Nara Prefecture that says he donated a quarter acre of fields to the temple. The name Shiō was the added name of Zeami, while Fuganji Temple was his family temple. As the record says Zeami died on August 8, it appears that he died on this day. There are no further detailed descriptions, however, including the year or place of his death. There is a theory that Zeami is likely to have returned to Kyoto, because the anniversary of his death was recorded at his family temple, and because there is historical evidence that some samurai punished by Ashikaga Yoshinori, the 6th shogun of the Muromachi Shogunate, were granted amnesty after he was killed by a vassal.